Ben Affleck follows his acclaimed Gone Baby Gone directorial debut by directing, co-writing and starring in a taut thriller about robbers and cops, friendship and betrayal, love and hope and escaping a past that has no future. He plays Doug MacRay, leader of a Boston bank robber gang but not cut from the same cloth as his fellow thieves. When Doug falls into a passionate romance with the bank manager (Rebecca Hall) briefly taken hostage in their last heist, he wants out of this life and out of the town. As the Feds close in and the crew questions his loyalty, he has one of two choices: betray his friends or lose the woman he loves. 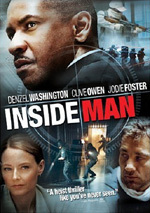 Jon Hamm, Jeremy Renner, Blake Lively, Titus Welliver, Pete Postlethwaite and Chris Cooper also star. $23.808 million on 2861 screens. Does a bad title doom a movie? Probably not, but it sure doesn’t help. A prologue indicates that the Charlestown area of Boston produces an abnormally high number of criminals. We follow some of these tight-knit crooks, with an emphasis on Doug MacRay (Ben Affleck), a lifelong Charlestown resident who leads the gang. As part of a bank heist, the guys briefly abduct bank manager Claire Keesey (Rebecca Hall). When they learn she lives smack dab in Charlestown, they follow her to figure out if she might be able to identify them. Along the way, Doug gets to know Claire and he falls for her. This certainly puts the gang at risk since Claire could possibly rat out the guys to the FBI. Special Agent Adam Frawley (Jon Hamm) stays hot on their tail, so Doug’s growing relationship with Claire threatens his freedom. Although Affleck enjoyed good critical appreciation early in his career, he eventually turned into a bit of a punchline. Of course, his relationship with Jennifer Lopez was part of this, but roles in flicks such as Gigli and a variety of action efforts. 2007’s Gone Baby Gone helped start his critical rehabilitation, at least behind the camera. It represented his first writing credit since the Oscar-winning script for 1997’s Good Will Hunting, and it also marked his first full-length effort as director. The film didn’t make much of a dent at the box office, but it received plenty of nice notices and reminded folks of Affleck’s talent. Town continues to indicate that Affleck displays good talents as a writer and director, and it also helps bring him back to life as an actor. Affleck isn’t and probably never will be a truly great performer, but he possesses more skills than the common thought process would indicate; he’s just been buried in bad roles for so long that he never got much of a chance to show us anything. In Town, Affleck has the opportunity to play a complicated character, and he does pretty well. He dominates the movie; though he doesn’t appear in every scene, he shows up in the majority of them, and he obviously acts as its most complex personality. His partners are left as pretty one-dimensional guys in the “loyal but ruthless thugs” domain, and neither Claire nor Frawley develop much past their stock origins either. Because of this, Doug becomes the only role with the chance to grow, and the film depicts his journey well. It moves at a deliberate pace that occasionally threatens to become too slow but never does so. Where it could plod and drag, it instead feels natural and full. The movie’s pacing allows the flick to develop in a satisfying manner that feels neither rushed nor sluggish. As a director, Affleck manages to bring good life to the tale. At no point does Town ever threaten to become anything especially fresh. Haven’t we seen plenty of similar stories about criminals who try to go straight? Yup, and I can’t say Town finds a particular twist on that genre. However, it does manage to explore its subject matter well, and that makes it worthwhile. Despite the pitfalls that come with borderline cliché story material, The Town delivers enough feeling and introspection to make it a good drama. 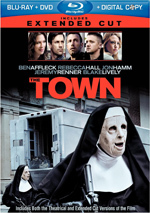 The Town appears in an aspect ratio of approximately 2.40:1 on this Blu-Ray Disc. The movie’s design meant it looked gritty, and the transfer seemed to reproduce it well. Overall sharpness was good. Some dim scenes could be a little soft, but those didn’t become an issue. Most of the movie displayed nice delineation and clarity. I saw no signs of jagged edges or moiré effects, and the film lacked edge enhancement. With a fair amount of grain, digital noise reduction didn’t seem to affect the proceedings, and the image lacked print flaws. Most of the movie went with heavily stylized hues. Chilly blues dominated, though amber streetlights were another motif. Occasionally, the film showed some more natural tones but not often. This meant the film lacked much color but the hues were fine given the film’s restrictions. Blacks appeared deep and tight, while shadows were decent. The movie used quite a few low-light shots, and some of these seemed a bit murky. However, the majority displayed positive delineation. You won’t use The Town as a home theater showpiece, but it presented the movie in a more than acceptable manner. Similar thoughts greeted the DTS-HD MA 5.1 soundtrack of The Town. Though a few action-oriented scenes opened up the spectrum, most of the flick opted for general ambience. It delivered solid environmental material that gave us a good sense of the various situations. When the film went into overdrive, that’s when the mix got a chance to shine. We found a fair amount of gunfire, explosions, cars and other loud, aggressive elements. These remained fairly infrequent, but they added some pizzazz to the proceedings. Audio quality was usually fine. Some dialogue became a bit tough to understand, mostly due to a) accents, b) characters in masks, and c) accents from characters in masks. Overall intelligibility remained positive, but on a few occasions, I needed to slap on the subtitles to figure out what I’d just heard. The rest of the mix fared better. Music showed nice range and clarity, and effects came across with positive reproduction. They seemed clear and accurate, and they also featured solid low-end during the louder sequences. All of this added up to a “B” soundtrack. A few extras flesh out the set. The disc includes both the films’ theatrical version (2:04:44) and an extended cut (2:30:17). Because the Blu-ray offered my first screening of the film, I couldn’t identify the differences. The movie comes with a marker that indicates the added footage, but I kept it off to avoid distractions. Anyway, I wanted to mention that two versions of the flick show up here. Next comes an audio commentary from co-writer/actor/director Ben Affleck. He offers a running, screen-specific chat that can be viewed alongside both the theatrical and extended cuts of the film. I only went with the longer commentary, but it appears they’re essentially identical and the theatrical commentary simply edits/alters the extended edition’s piece. During this piece, Affleck discusses cinematography and visual design, cast and performances, sets and locations, stunts and action, adapting the novel, story and characters, editing and changes for the extended cut, and a few other thoughts about the flick. Though Affleck’s commentary for Gone Baby Gone wasn’t great, he provides a much better chat here. We still don’t get much of the humor that made Affleck’s prior acting tracks such a delight, but he throws out a few funny lines, and he certainly delivers more than enough info about the film. He covers a good variety of topics in a full, interesting manner. And he’s even willing to discuss potential problems! In an unusual twist, Affleck doesn’t seem all that wild about the extended cut of the movie. He often comments on the additions and points out why they didn’t work in the theatrical edition. That’s intriguing; normally directors seem much happier with their longer cuts, so it’s enjoyable to hear him discuss the problems he perceives. That’s just another reason this becomes a winning commentary. Under Ben’s Boston, we find six “focus points”. These last a total of 30 minutes, 25 seconds and include “Pulling Off the Perfect Heist” (2:51), “The Town” (4:57), “Nuns with Guns: Filming in the North End” (4:52), “The Real People of The Town” (3:06), “Ben Affleck: Director and Actor” (7:34) and “The Cathedral of Boston” (7:03). Across these, we hear from Affleck, FBI consultant Thomas B. Devlin, screenwriter Aaron Stockard, stunt coordinator Gary Hymes, producers Graham King and Basil Iwanyk, executive producer David Crockett, Boston Red Sox executive VP/COO Sam Kennedy, second unit director Alexander Witt, property master Douglas Fox, location manager Mark Fitzgerald, and actors Jeremy Renner, Jon Hamm, Rebecca Hall, Slaine, Titus Welliver, Owen Burke, and Blake Lively. The pieces examine aspects of robberies and their depiction in the flick, location elements, stunts and action, cast and performances, Affleck’s work on both sides of the camera, and shooting at Fenway Park. Some of the material repeats from the commentary, and the tone tends to remain somewhat fluffy – especially during “Director and Actor”, which acts as a love letter to Affleck. Still, we find a mix of useful elements. The pieces are inconsistent but generally worth a look. 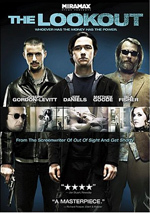 A second disc provides both a digital copy of The Town for use on computers or digital portable gadgets as well as a DVD copy of the film. This delivers a barebones package, so don’t expect any extras. While not blessed with a particularly fresh story or characters, The Town does come with solid execution, and that makes all the difference. We invest in the tale and find ourselves pulled along by the clear, deliberate pacing. The Blu-ray delivers good picture and audio along with some decent supplements led by a strong audio commentary. The Town comes as an involving drama.